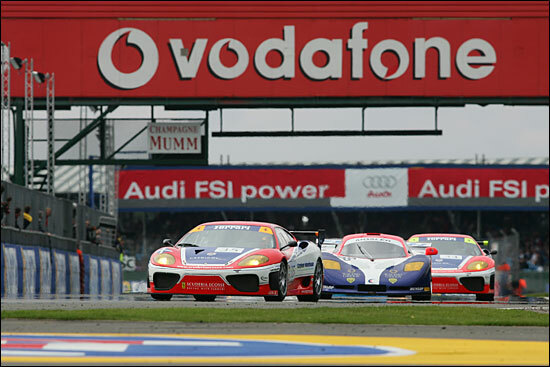 With a two hour race in prospect, hopes were high in the Eclipse camp – for Sunday’s British GT event, at the Le Mans Endurance Series meeting at Silverstone. 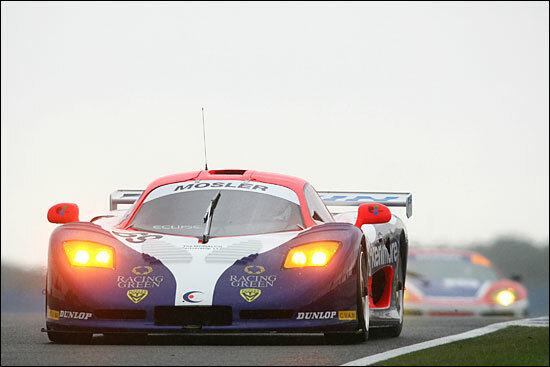 The team's Mosler MT900R had already shown race-leading pace at Thruxton and Castle Combe, and with the wide open spaces of the Grand Prix circuit well suited to the grunty V8, perhaps there would be an even better return on the team's investment, after testing and development work here? 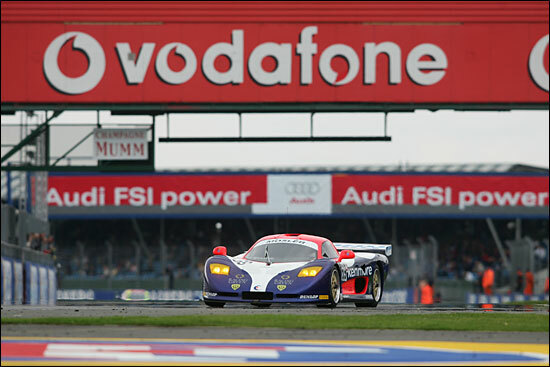 Phil Keen put the Mosler on the second row of the grid, right behind the pole-sitting, championship leading, Andrew Kirkaldy pedalled #35 Scuderia Ecosse Ferrari. A battle for the first corner (and all the rest of the corners) looked very likely indeed. We weren't to be disappointed - but first there was the early frustration of a weather-affected start, a few drops of rain persuading the Clerk of the Course to command two exploration laps behind the Safety Car, before racing proper commenced. Those two laps (and the time they took) counted towards the two hours duration, so everyone was impatient to get going as 'lap 3' began. None more so than Phil Keen: he split the Ferraris on the first lap …. 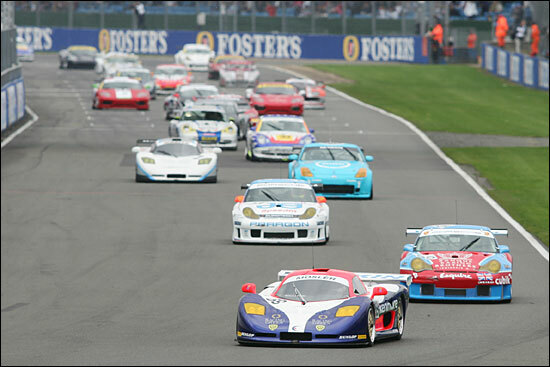 only to find the race once more under a Safety Car, after a GT3 car suffered a bout of incontinence at Copse. Champing at the bit then, Phil? Once racing eventually resumed, Phil Keen had a challenge on his hands, but this wasn't going to be easy. Kirkaldy began to ease away at the front, 5.5 seconds ahead of the Mosler by lap 14 , so nothing unusual so far: it had been one of Andrew Kirkaldy's 'straightforward' races... but that was about to change, big time. Spots of rain appeared on lap 19 (rubbing your hands with glee, Phil? ), and patchy rain, sometimes heavy, would continue for a good 30 minutes. Kirkaldy's pace slipped to 2:03s (from a best of 1:54.756), while Phil Keen's Eclipse pace was stunted far less than the Scot’s, and he started to reel the Ferrari in rapidly. 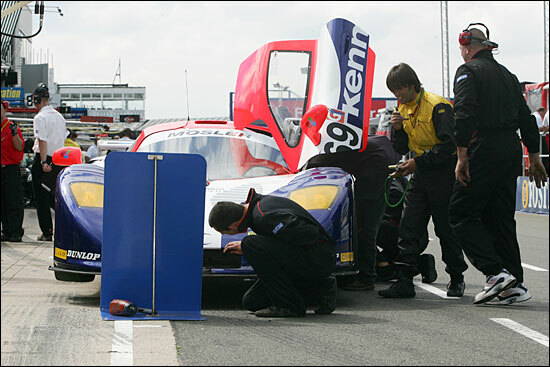 Scuderia Ecosse readied its intermediates, while others chose to leave their men out as they were (the Mosler on slicks). Lap 21 and Phil rumbled by the Ferrari on Hangar Straight - but tyre choice, with the track getting very greasy indeed in places, but with clear skies beyond, was now the critical decision. He's seen leading the Ferrari, below. 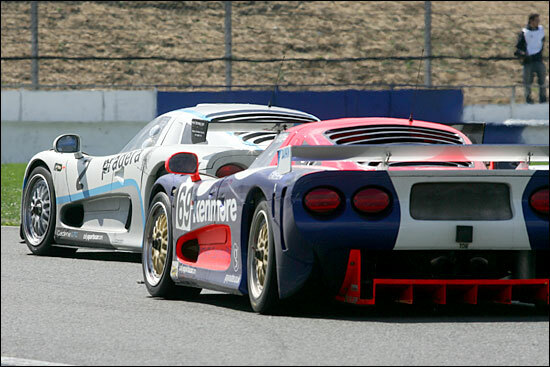 Phil Keen exited Woodcote sideways, wonderfully sideways, in the Eclipse Mosler as he completed lap 23, but Andrew Kirkaldy pitted. Wets were fitted on the Italian car, but with Eclipse staying out on their slicks and hoping the weather would improve - fast! It did, briefly - 2:21s became 2:09s. Nathan Kinch was nearly a lap down as he rejoined and was lapped soon afterwards. Behind the Mosler meanwhile, Ben Collins, the Embassy Porsche also staying out on slicks, was holding station, 20 seconds or so behind. No driver could drive for more than 90 minutes, but Eclipse and Embassy left their men out there to race - even when rain fell again on lap 29. The two slowed to 2:13/2:15, Kinch now lapping in 2:19. No, hang on, lap 31, 45 minutes left - heavy rain, at least on this side of the circuit. Keen edged away, and still stayed out next time around - but Ben Collins didn't. It had stopped raining, but the track was wet: wets or slicks? Or inters? Cunningham jumped in, and the existing rubber was left on. Good move or not? 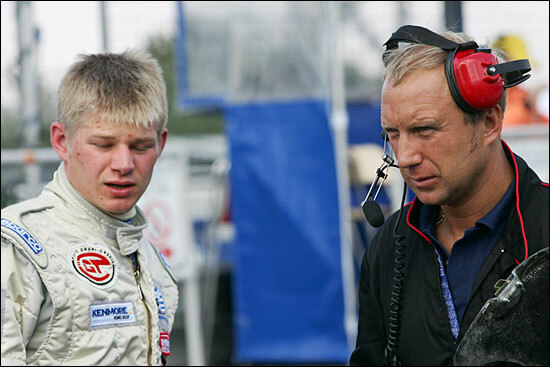 Kinch on wets was faster than (the still not pitting) Keen at this stage, but Collins' fine work saw his partner reappear in third, ahead of the #35 Ferrari. The clouds, driven along by a gusty wind, had slipped by, and it was getting brighter. 38 minutes left, eight minutes maximum for Keen to exploit the advantage of the slicks. 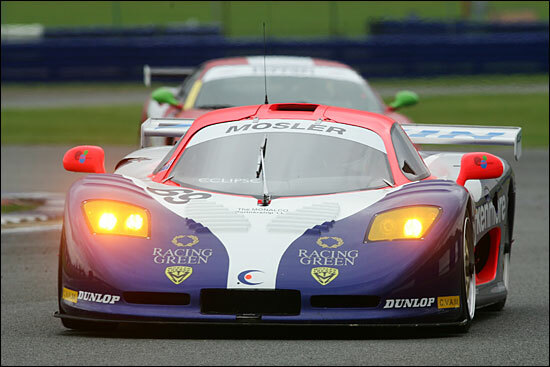 It was seconds before the 90 minute deadline passed when the Mosler finally appeared in the pitlane, after an exemplary stint, leading convincingly in the trickiest of conditions. The bad news however was that Steve Hyde would have to acclimatise to those very same conditions, with a Ferrari closing fast. First flying lap and the Ferrari was nine seconds behind with Neil Cunningham in the Embassy Porsche a further 40 seconds or so further back followed by the rapidly improving Nissan 350Z. 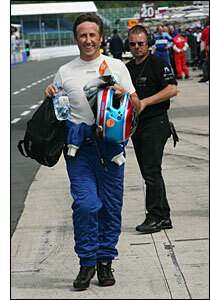 Less than a lap later though and Kinch took the lead, as Steve Hyde was finding it "very slippery out there on slicks". A 2:16 lap against a 2:26 told the story. Godfrey Jones showed just how slippy it really was, with a lurid double 360 spin exiting Woodcote. Steve Hyde didn't want to do likewise, understandably. At this stage intermediates were clearly the Dunlops to have, Hyde really struggling on slicks in increasingly treacherous conditions and finally spinning on the greasy surface at Luffield, losing second in the process. Steve was having an increasingly difficult time and had no answer to a fired up Neil Cunningham, the Embassy Porsche on a mission and breezing by the Mosler. It would be a frustrating series of laps to the finish for Steve, another spin at Luffield allowing the Cadena Mosler to get back on terms: Gavan Kershaw would eventually take the place (below), but after a spirited defence, and finally Mike Jordan grabbed fifth on the very last lap. A race which had promised so much had - quite literally - slipped away. The race was won, in an astonishing last couple of laps, by the Embassy Porsche, the Ferrari and Nissan finally finding that their wets and inters had given their best in the rapidly drying conditions. A topsy tury race and a great one at that, Eclipse having played a major role in a dramatic encounter. Phil Keen was rewarded for a stunning effort with the Sunoco Driver of The Weekend Award (his second in three races) but that was cold comfort after a race which, if the weather hadn't played a final winning hand, might well have gone the team's way. Phil Keen: "The Ferrari got away quicker than I thought he would but when the rain started he began to make mistakes and I didn't. It really was 'full wet' conditions for quite a while, very difficult and worse still it was varied all over the circuit, Copse was very bad, but Club was fine." Steve Hyde (still smiling, right): "It was a bloody nightmare out there. I had no mechanical grip whatsoever and just couldn't find a balance at all, the car was breaking away from me everywhere, front and back. I'm really disappointed." Mixed fortunes then for Eclipse and its drivers – but what a fabulous middle 60 minutes. 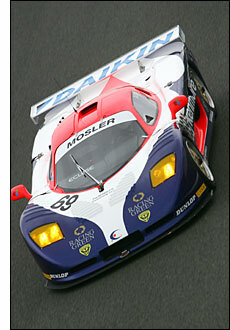 Phil Keen (with John Griffiths, below) and the Eclipse Mosler had shone very brightly, very brightly indeed.